I hope the New Year has brought in a lot of cheer and happiness in your lives too .I started writing my blog in 2014 itself .Today I would like to give a vote of thanks to all the bloggers ,because it is only them who have inspired me to write my heart out ( though I still am not doing so literally ) but at least I have taken baby steps . The Very Inspiring Blogger Award .I wish him all the best in future . 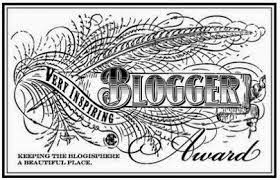 I also want to thank Indiblogger to provide this platform and network to us bloggers . I asked my daughter this question and she said that it is very difficult to find something nice about you ! People who know me closely feel that I am very emotional and forgiving . People who do not know me closely feel that I am detached and clinical . There was a time I was a bookworm , except for Economic times I could read anything anytime ,things are different now ,but I try to fulfill my love by randomly visiting blogs . I love to travel and explore ,but never have been courageous enough to do it on my own . I hate hypocrisy and insincere praise .Also making fun of physical limitations of a person . I seriously believe that blogging can help bring change and awareness about issues . I wanted to also quote the reasons why I found you inspiring ,but that would make it very lengthy so I would just say that I have gone through your blogs and found that I could connect with you easily.Of course their are many more who have been inspiring me like Pranab (http://scepticemia.com/) , Mickey Fernandes , Tanishq ...the list is long and there still are so many undiscovered blogs . I will conclude by stating that all of you have inspired me either personally or because of your writing style and sometimes the issues and stance that you take have inspired me to improve myself . Thank you all once again . I feel those who forgive easily are calm and people mistook it as being clinical. Even I hate those who don't think beyond physical appearances. Many congratulations on the award and thanks a ton for nominating me. Truly honored. Btw, love your blog's url. Thank you Saru, it has been a pleasure to know you and your blog . Thanks for the honour dear, it means a lot. I only know you through your great blogging , Wish to see much more of that in the near future too,Thanks ! Thanks so much Preeti for this award! :) Nice to know more about you! We share some things in common- like not liking insincere praise & loving to travel- not alone but with friends or family! Whenever I write this post, I will inform you back! :) Thanks so much again!